Rating CRE loans according to risk is a long-established practice in the financial industry, however it has become much more important because of the increasing requirements for quantitative risk reporting, e.g., for Basel capital and stress testing. Over the last few decades it has become conventional to rate loans according to their probability of default (PD) and loss given default (LGD). For simplicity, in this article we focus on the PD metric and how that should be interpreted for commercial real estate loans. As an example of the disconnect between the first year PD and the overall risk, consider a property with a single large creditworthy tenant. This loan may have much lower risk in the first year than a property with 5 smaller units, however if that large tenant’s lease expires in year three, the risk will peak and may be much higher than that of the diversified property. Similarly an interest-only loan will have low PD in the first year, but a spike of refinancing risk at maturity and therefore its low PD in the first year does not reflect the overall risk. 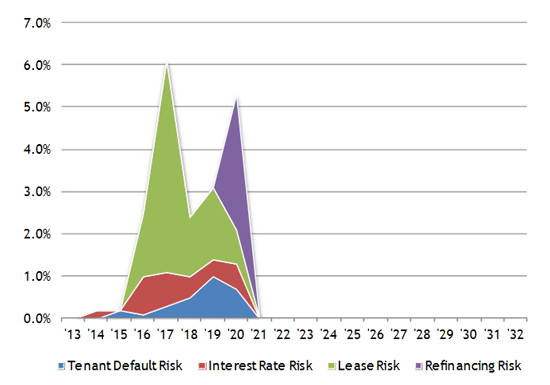 Such fundamental differences in the risk profile means that the year-one risk does not represent the risk of the loan as a whole and therefore there is not an obvious mapping between CRE loans and other loan-types. One solution would be to take the average PD over the life of the CRE loan, but this is an unfair comparison with commercial loans because for a commercial loan the year-one risk is typically lower than the average risk over all of the years. The consequence would be that CRE loans of "the same risk" would be assigned higher PD and therefore a higher capital than "similar" commercial loans. The next step is to compare the NPV of loss for the CRE loan with the NPV of loss for a reference set with the same balance profile. The reference set can be a set of bonds or loans with their grades and defined PD profiles over time. For this explanation let us assume the reference set is a set of commercial loans. By comparing the NPV of loss for the CRE loan against the NPV of loss for each grade of the commercial loans, we can see which commercial loan grade best matches the CRE loan over the life of the loan. We can then take the year-one PD from the best matching commercial loan grade to be the equivalent PD for the CRE loan2. The overall result is that a CRE loan with a given reported year-one PD will have the same NPV of loss3 as a commercial loan with the same year-one PD. Fundamentally, the true risk is the irregular risk profile over time, and for detailed analyses that is the risk profile to be used, but for risk approximations such as portfolio reporting and Basel capital, this mapping approach provides CRE business units with an apples-to-apples comparison with the other asset types.